Now she's safe and warm. 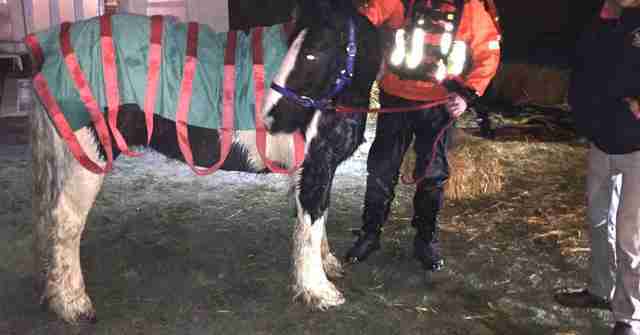 A horse named Dolly recently got herself into a wet and soggy situation. Two days ago, Hertfordshire Fire and Rescue Service were called to an unusual incident at a private home in Goffs Oak, England. 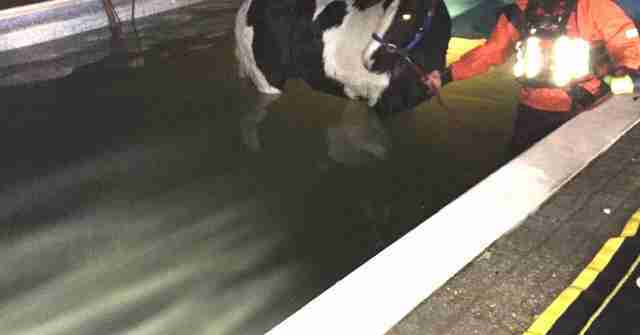 A little after 10:00 p.m., people discovered Dolly splashing around in their swimming pool. While it's not clear how the horse got into the pool, the rescue team knew they had to get Dolly out - and quickly. "It was around minus 1 [Celsius]," Rachel House, press officer for Hertfordshire County Council, told The Dodo. That's about 30 degrees Fahrenheit. In other words, it was freezing, and not the best weather to be paddling around in a pool. If the rescue team didn't get Dolly out, she'd probably die from hypothermia. A group of firefighters rushed to Dolly's aid, and spent two and half hours rescuing her. "Our firefighters rescued her by pumping most of the water from the pool to reduce the risk of her developing hypothermia," a spokesperson for Hertfordshire County Council wrote in an emailed statement. 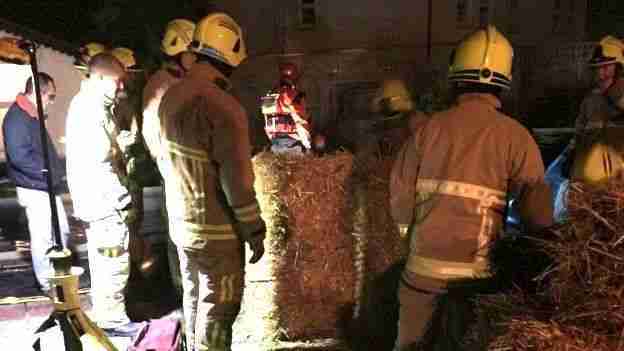 "They then built a ramp made of bales of straw provided by local farmers and used ropes and a harness to lead her out to safety." Dolly stayed calm throughout the ordeal, which was a great help to the firefighters, according to House. Dolly is now safe and warm, and back with her owners. A vet has also given Dolly a clean bill of health. Surprisingly, Dolly isn't the first animal Hertfordshire Fire and Rescue Service rescued from a swimming pool this year. "Twice in July 2016, a deer had to be rescued from a swimming pool in Buntingford," House said. Clearly, hoofed animals seem to have a thing for swimming.